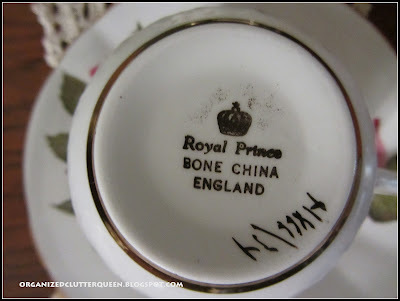 Bone china tea cups were one of my first collections. I have early memories of beautiful tea cups in jewelry shop windows across the river in Canada. My Mom had a small collection of tea cups that were displayed in a black metal wall shelf in the kitchen. My Grandma had tea cups in her china cabinet. Beautiful tea cups were given as bridal shower and wedding gifts. It was fashionable to display tea cups. I still display mine. When I am not blogging, I am selling furniture four days a week! China cabinets, china hutches, and curio cabinets have declined in sales over the years. Formal dining rooms are giving way to combination great room/kitchens. Minimalism is in vogue. Tea cups sell at thrift stores for $2-$4 each. Good for me, but sad that not many still appreciate a beautiful tea cup. 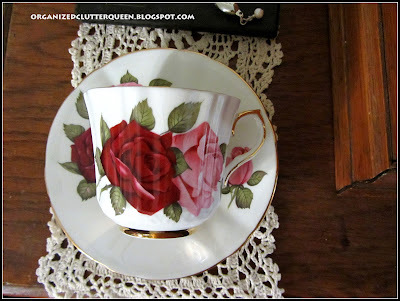 I have decided to feature one of my tea cups every week on my blog. If you are a tea cup collector, you will like it, if not, maybe I can convert you! 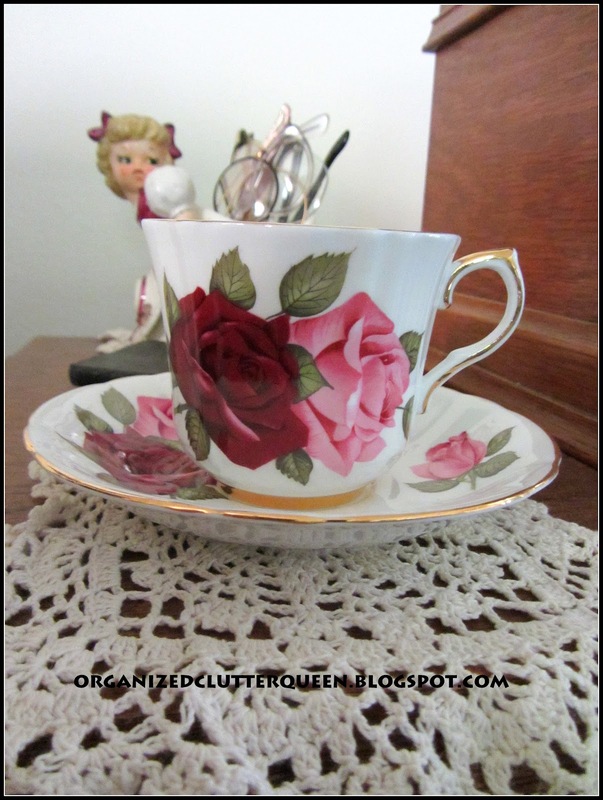 My first tea cup to be featured is a Royal Prince Bone China fluted cup with roses. This tea cup is sitting on my vintage sewing machine with a girl figural planter and vintage eyeglasses. Your cup is pretty...you can never go wrong with the roses! What a beautiful tea cup. They cost more here as well. It is interesting what is in anymore. Thanks for sharing your tea cups. 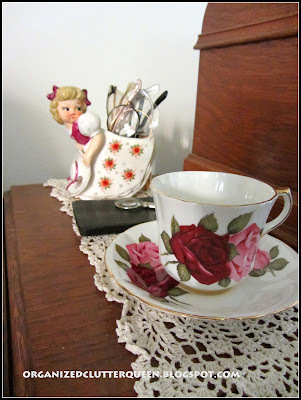 Well, I am one of those old fashioned girls who loves and collects teacups and teapots. I love china in general. I very seldom find any teacups for two to four dollars around here. Even in the thrift shops, it is difficult to find one under five or six dollars. But it is fun to look. Yours is very pretty and I look forward to seeing more! I am so happy you have joined my tea party this week. It is a pleasure having you. Enjoy your week. Beautiful teacup! My mom has always had a collection of pretty teacups & every time I visit, I always want tea in one of them. I think tea tastes better in a pretty teacup! Love your pretty tea cup! I have a few that I use when I want to feel special and treat myself. Can't wait to see more of your collection. Teacups are a passion for me! Glad you are joining our tea related memes. That's a lovely one! My grandmother started my collection years ago. Thanks for sharing and linking to Tuesday Cuppa Tea! Gorgeous. I love tea cups and other china. It is a pleasure to visit you for Tea Cup Tuesday! I love your sweet vintage cup! What beautiful roses....and the shape of the cup too is very lovely. I too, have memories of seeing those tea cups in jewelry shop windows in Canada! Windsor, Canada for me....I grew up outside of Detroit. Eventually I moved to Ontario and spent many years there. That is where I learned to drink hot tea, as well as to love tea cups. 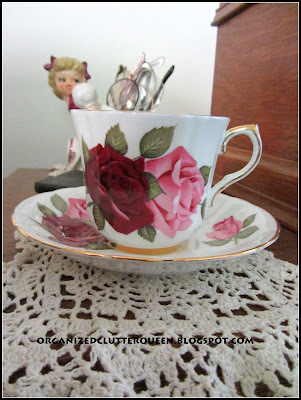 Hi Carlene, I love the pink and red combo of the roses on this pretty cup. Looking forward to seeing the rest of your collection. Hi Carlene, bring on the teacups!!!!! The one you've shared today is lovely. I adore roses! Happy Tea Day! Hi Carlene! Teacups were my first collection as well. It started when my great grandmother used to have me over for afternoon tea with her fine china. I was only 10 years old. And I would dress up and go over there and loved all the pretty things she used. When she died (a couple of years later) she left me all her tea things. Your teacup set is beautiful! I hope you are having a wonderful day! Carlene, your teacup is beautiful! I have a few teacups but none as pretty as this one. Carlene, I don't have a tea cup collection, but I certainly appreciate yours. Love that you have that history at your fingertips, but it is sad to see the ways of the past all disappearing. Good for you maintaining that genteel way of days gone by. I can't wait to see some more. I love tea cups and yours is just so pretty, I love roses. I agree with you on the price....that's usually what I find mine for as well. I don't have a lot of them but I'm hoping to expand my little collection. Thanks for sharing and have a great night!